Hessel Mi is a pretty village, located in the Les Cheneaux Islands of Michigan's Upper Peninsula. 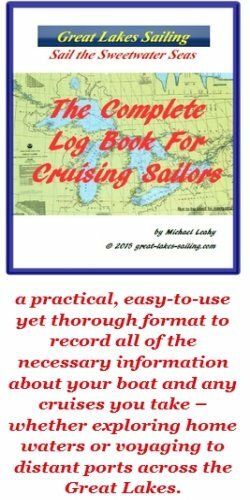 It is a perfect stop-over point for cruisers heading east into the North Channel or west towards the Mackinaw Straits and the long reaches of Lake Michigan. You will often hear the name "Les Cheneaux associated with Hessel. Les Cheneaux (French for 'The Channels') is a group of 36 islands at the northern end of Lake Huron. The sheltered bays, channels and quiet coves make for ideal sailing and boating. It is a wonderful place to experience the beauty of the northern Great Lakes. The roots of the village date back to the early 1880's and the lumbering industry. Today, the economic mainstay of the village is tourism. A cruising sailor will not be disappointed tying up in this delightful harbor. The Channel into Hessel MI is well-marked. Pick up the first marker off Brulee Point, a Fl GREEN ('G1"). Follow the channel until 'R4", a Fl RED marker. Once you clear "R4", alter course to approximately 083°T and proceed to Hessel Marina. Coming from the east through Les Cheneaux Islands, follow the Small Boat Course, clearly marked on charts. Once you clear St. Ledger Island and Hessel Point (both on your starboard), follow a course of approximately 317°T to Hesel Marina. If you stay offshore, coming south of Les Cheneaux Islands, follow a course of approximately 313°T, between Marquette Island and Goose Island to marker buoy "G1", a Fl GREEN marking the entrance into the West Channel. Follow the channel until 'R4", a Fl RED marker. Once you clear "R4", alter course to approximately 083°T and proceed to Hessel Marina. Hessel Marina has 36 slips with 30 available for transient sailors. There is no fuel dock. There is a pumpout station. Restrooms, showers and a laundry room are available. There is water and power to all slips. There are picnic areas with BBQ grills. There is also a courtesy vehicle available to help with errands. E.J. Mertaugh Boat Works has been in business since 1925. This was the first Chris Craft dealership in the world. They have several slips available for transients. There is a fuel dock (diesel and gasoline) This is a full-service marine yard with decades of experience in engine, mechanical, electrical, fibreglass and especially woodworking repairs and maintenance. The can also carry out work on sails and canvas. Hessel Grocery is steps from the marina and can meet provisioning requirements. There is no bank or ATM in Hessel MI. There is no clinic or hospital in Hessel MI. The nearest clinic is War Memorial Hospital Family Care Clinic (906) 484-2295 located in nearby Cedarville - 4 mi/6.5 km east. The nearest hospital is Mackinac Straits Hospital (906) 643-8585 in St. Ignace, about 30 mi/50 km southwest. The nearest pharmacy is Alfstrom Pharmacy (906) 484-3355 in nearby Cedarville, about 4 mi/6.5 km east. Hessel Grocery has a deli counter that can put together very good deli sandwiches and lunches. The very popular Islander Bar is a good choice if you want a meal in the village. The former Hessel Bay Inn is now a school for culinary arts and they offer wonderful lunches and dinners, all featuring locally-sourced ingredients. The premier summer event in Hessel Mi is the annual Les Cheneaux Antique Wooden Boat Show held every mid-August. Keewadin Casino is nearby for those who want to try their luck.. For those who enjoy a leisurely stroll, the village has interesting little shops waiting to be explored. For hikers, there are walking trails in the surrounding countryside. The Hessel MI and Les Cheneaux tourism page will give you more ideas on how you can enjoy your time here.